According to Sensortower, 30% of mobile app downloads accrued to the App Store in the second half of 2018. This humble share was enough to bring 66% of global mobile app revenue and make Apple’s platform the most lucrative app store on the market. So conquering the App Store is always a good idea moneywise. Apple Search Ads is a relatively new mobile app advertising platform as it was launched in late 2016. However, it’s probably the best solution for iOS apps developers. It gives publishers a unique opportunity to top search results and get exposure to the specific niche that targets only one operating system. Search Ads Basic. Within this solution, you pay for installs instead of taps with a $5,000 monthly budget cap. However, if you choose this option mind that there are no keywords or audience refinements and the reporting is limited. Search Ads Advanced. Within this solution, you pay for taps like in a standard PPC mobile app advertising channel. The solution allows you to choose keywords and audiences based on demographics, device type, etc. Furthermore, your Apple Search Ads campaigns can be managed on the basis of revenue metrics. Thus you can track the improvements of App Store ads performance over time. 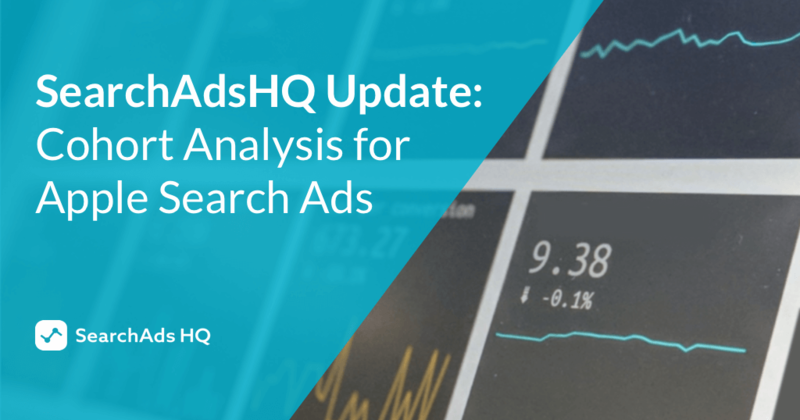 In our analysis, we’ll focus on Apple Search Ads Advanced more. The ad in this user acquisition channel is generated automatically based on your app’s existing metadata and the elements of its product page (video and/or screenshots). 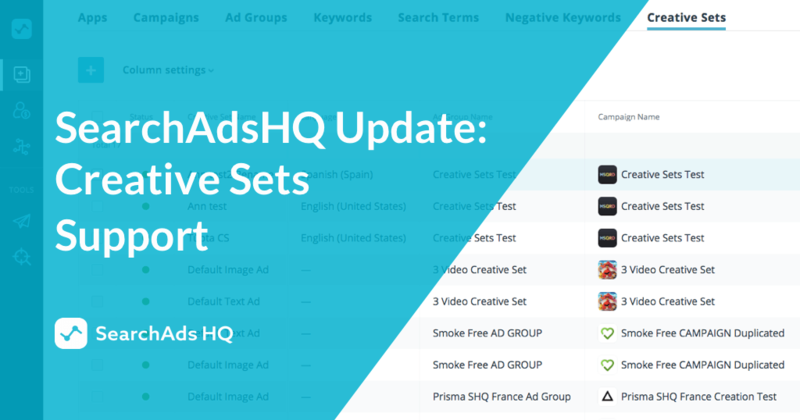 Creative Sets is the only way of Apple Search Ads customization and control over your ad listing. 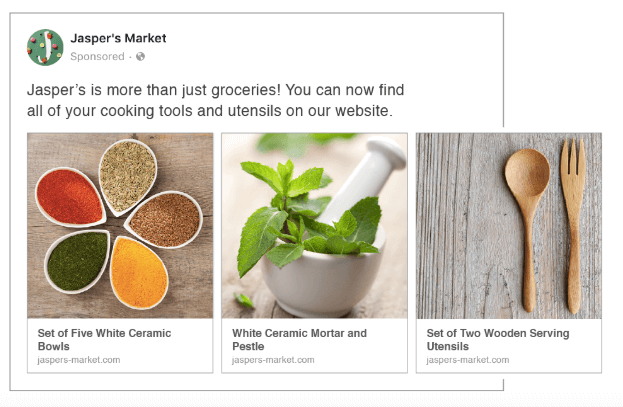 It’s possible to adjust various sets to different ad groups, but, once again, a Creative Set can include only visuals from your store product page. Apple Search Ads is a keyword-driven mobile app advertising channel which works on similar principles as text ads in Google Ads. The most popular mobile app advertising channels sell ad space through second price auctions and Apple Search Ads is no exception. Nevertheless, in the case of the App Store ads, Apple also highlights the critical importance of app relevance instead of the sheer price. The highest bid doesn’t ensure your ad will be shown unless your app essence and its metadata highly correlate with a search query. Great user experience is one of Apple’s most treasured values and the team does its best to prevent their users from seeing irrelevant ad banners. As it was mentioned above, Apple Search Ads allows you to pay for installs or clicks depending on the plan. So please mind that there’s no option to pay for impressions like in Google Ads and Facebook Ads. 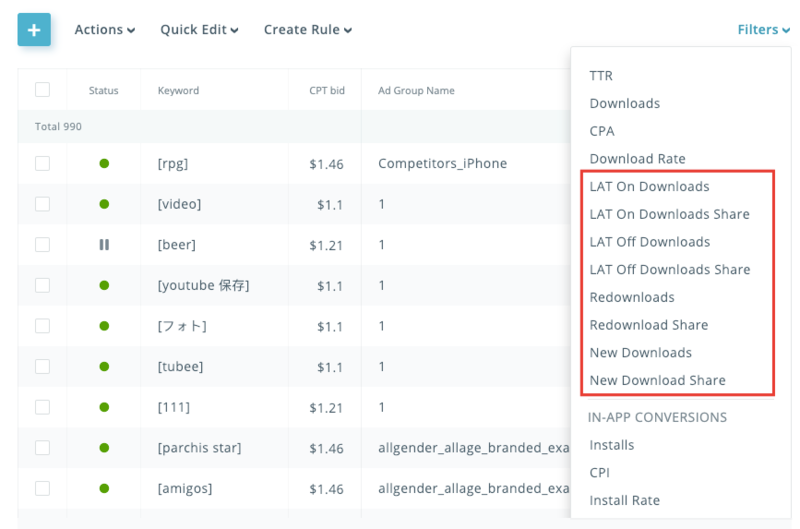 When it comes to Apple Search Ads, one should keep in mind LAT (limited-ad-tracking) which is used by approximately 15% of App Store visitors. This feature allows users to block their unique id address from being shown to advertisers. It means that you won’t be able to get any data on such users past an app download. Sure, limited-ad-tracking complicates the evaluation of your App Store ads performance but Apple shows LAT conversions on its dashboard. Furthermore, such third-party solution as SearchAdsHQ provides additional discrepancy metrics which let you get a better picture of the situation. Apple Search Ads provides two types of keyword settings: broad match and exact match. Managers who work with Google text ads are quite familiar with these terms (by the way Google also provides intermediary options). It’s important to remember that broad match in Apple Search Ads is truly broad and it’s recommended to use it for new keywords discovery rather than in regular campaigns. 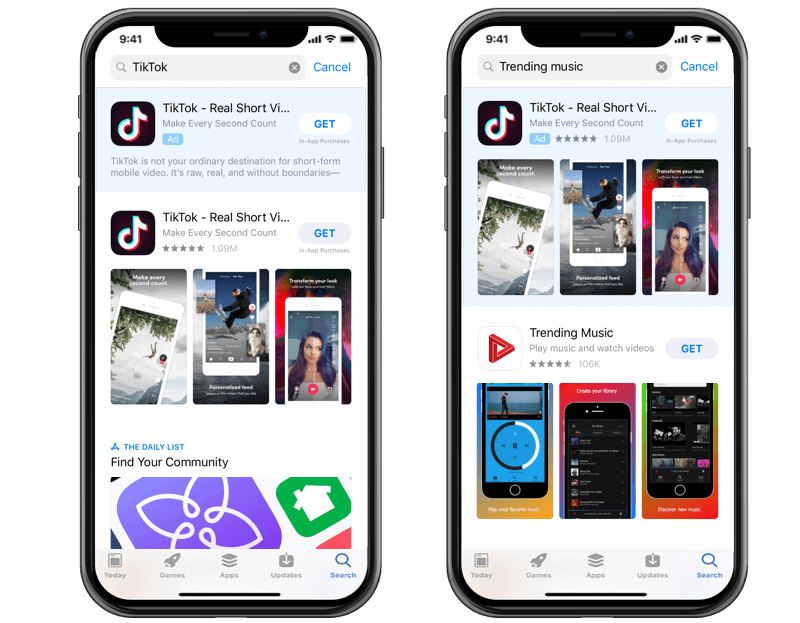 Above all, Apple Search Ads offers you the prime spot in the App Store search showcasing it in front of a high-intent audience which converts into high LTV users. Taking in consideration that almost two-thirds of apps are found through the App Store search, this mobile app advertising channel is an invaluable tool that developers can utilize to improve their app’s visibility. Apple Search Ads may also favor an overall rise in your app ranking and lead to more organic traffic. It’s possible because Apple’s algorithms include metrics from installs attributed to ads for their Top Charts. In contrast, Google separates organic search results from pay-per-click ads. Search Match feature is an amazing option Apple Search Ads offers. The system automatically matches your ad with relevant App Store user searches becoming a great source of new keywords discovery. Bid Strength Indicator – red, yellow or green-colored bars let you know how well-placed your bids are in comparison with the ones of your competitors. On top of that, Apple Search Ads can boast pretty impressive conversion rate of about 50% at a sensible cost. The average Cost per Tap of the App Store Ads is about $0.95. The price might be considerably higher for the most competitive keywords but let’s not forget that Apple Search Ads is a premium mobile app advertising channel which lets a strongly motivated audience see your app. The main issue is that Apple Search Ads doesn’t provide information on post-install events. Sure, mobile trackers have this data but it’s really inconvenient and time-consuming to switch between dashboards and correlate CSV reports to evaluate the efficiency of your campaigns and identify the most powerful keywords. Luckily, this problem becomes a matter of the past if you run your Apple Search Ads campaigns with SearchAdsHQ. 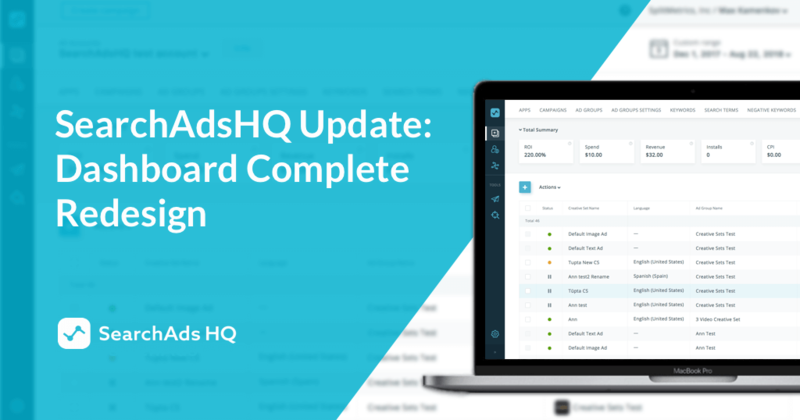 Its dashboard has data from both Apple Search Ads and mobile attribution partners providing such metrics as CPI, Revenue, ROAS, ARPU, etc. Thus you can check your App Store ads performance in no time, identify budget wasting keywords and recalibrate them. Another Apple Search Ads downside is little control over the look of your ad banners. As it was mentioned above, Creative Sets is the only method of customization. And finally, the list of available storefronts is limited at the moment, it includes 59 countries. However, we shouldn’t forget that this mobile app advertising channel is quite young and keeps developing. Thus further storefronts expansion is only a matter of time. Google Ads is an advertising network of the largest search engine launched in October 2000. Up to 2018, it was known as Google AdWords. This advertising platform combines the Google Adwords ad buying interface with Google traffic sources. App Ads – designed for promoting apps across the entire Google network. Normally, Google Ads is perceived as a keyword-driven platform. Using this tool, you bid for specific keywords and hope to earn one of the top positions. However, when it comes to Google Display Network, we can say that its targeting is audience-based. Both Google Ads and Apple Search Ads work on the basis of a second price auction and targeting is formed with the help of keywords. This means that users on both platforms are specifically searching for a certain topic (unlike Facebook, where ads are shown based on user interests). Similarly to Apple Search Ads, you don’t always have to be the highest-paying bidder in order to deserve your place in Google Ads. But even though ad relevance is considered, plenty of cases showed that Google Ads doesn’t tremble over the correlation between ads content and your app as much as Apple does. In Google Ads, you can pay for clicks (text ads) and impressions. It’s also possible to optimize your ads for conversions or some custom actions within a web page. Numerous studies show that the vast majority of online experiences begin with search engines, Google in particular. Around 36% of mobile searches are local and made using Google. In such circumstances, Google Ads will make your mobile app highly visible and accessible to almost all Internet users. This mobile user acquisition platform gives you a lot of control over the visual aspect of your ads as you choose text and images yourself. 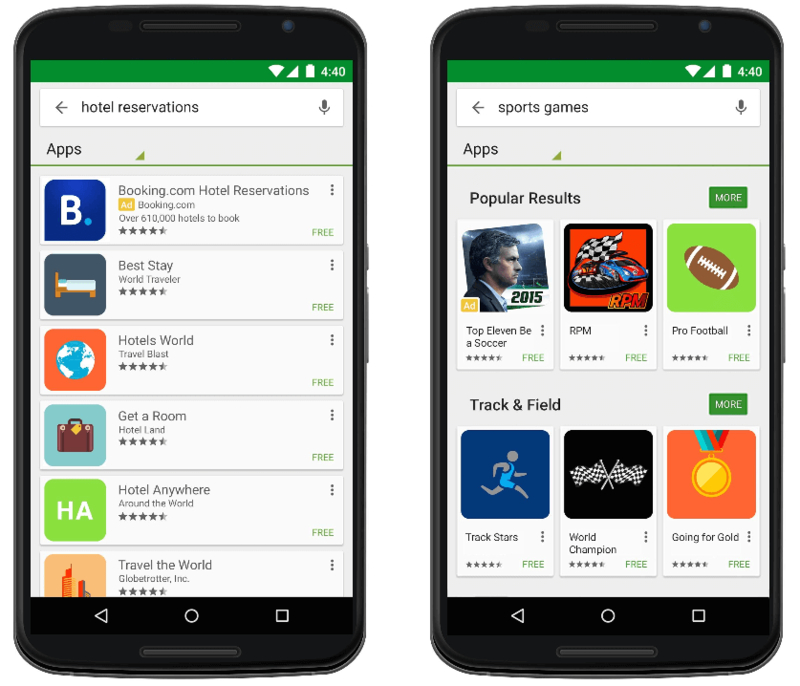 Google Play Search Ads lets you promote your Android apps in the store directly. It’s one of the best options for Android developers as thus ads are shown to the users in search of new apps. If you choose Google Ads for advertising your mobile app, you’ll be able to track users post-install activity thanks to integration with attribution and analytical partners such as AppsFlyer, Firebase, etc. Cost per Click (CPC) can be very problematic in the most competitive industries. 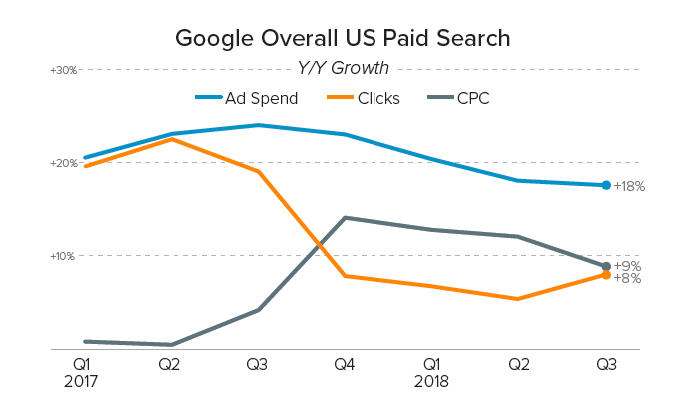 Google Ads charges up to $50 per single click in industries such as mobile, insurance, banking, loans, and attorneys while average CPC is $2.69 in Search Network and $0.63 in Display Network. Another issue is that the competition in Google Ads is brutally intense. If you’re new to mobile app advertising it might be quite problematic to achieve desired results for your app without spending a good deal of money. And probably one of the worst issues is that your app isn’t shown in the store directly (unless you use Google Play Search Ads). It’s a huge shortcoming as users often are shown the ads they’re not necessarily interested in. And even if your ad banner managed to captivate them, it’s necessary to make at least one extra step to actually get an app. Facebook Ads has been active since 2007. The most popular social network may not be a specialized mobile app advertising platform, but it offers superb ad format, targeting and reporting capabilities which are among the best in the industry. Facebook’s app for businesses Workplace. 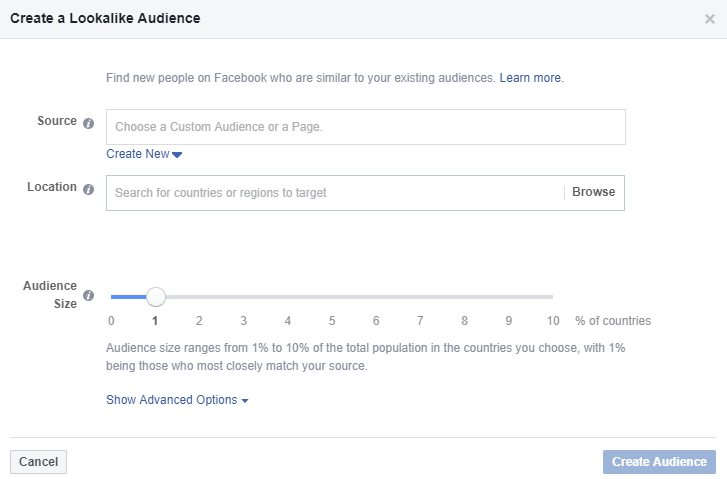 The cost of Facebook ads depends on such factors as the audience (the more precise your targeting, the more expensive your as might become), bid, competition, ad objective, placement, and quality/relevance. There’s a range of 6 ad formats that Facebook Ads offers to mobile app advertising managers. You can opt for a single image, carousel, collection, slideshow or Instant Experience to promote your mobile apps with various images and video. Image ads: this format includes a single image with a caption. 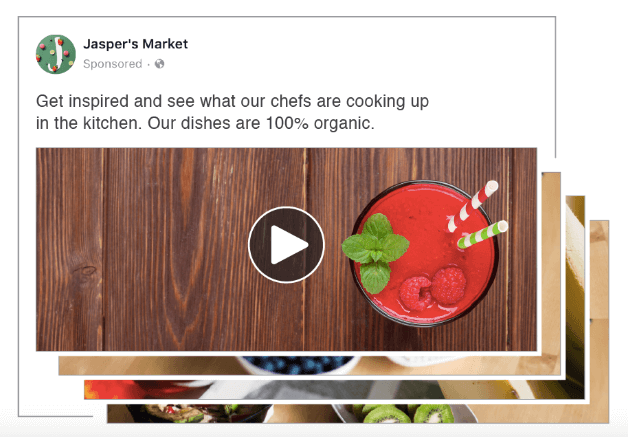 Video ads: this ad format is quite engaging, but remember that 47% of Facebook Video Ads value happens within the first 3 seconds. Slideshow ads: basically, it allows you to create an experience similar to the one users have interacting with a video without spending a fortune on video production. Carousel ads: Facebook lets you pack up to 10 visuals (images or videos) within a single ad. Collection ads: this option makes it possible to unite all of the above-mentioned formats. Instant Experience: it’s a mobile-only option which allows you to create a beautiful, full-screen destination for your Facebook Ads. 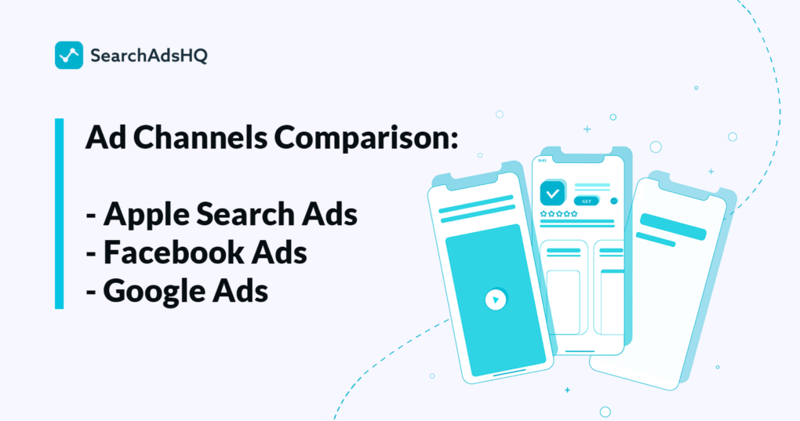 If we compare Facebook Ads and Google Ads, within both platforms, advertisers pay either for clicks or impressions and can optimize their campaigns for conversions or some custom actions. While the two platforms are very different in the essence, we can say that Facebook Ads is similar to Google AdWords in terms of data collection. Namely, both advertising platforms accumulate and analyze an incredible amount of data. Google can track pretty much anyone who uses the Internet, but Facebook also knows quite a bit about non-users as well. The fact that Facebook knows its users really well leads to the fact that Facebook Ads is an audience-based platform. It offers the best targeting and audience selection tools on the market. 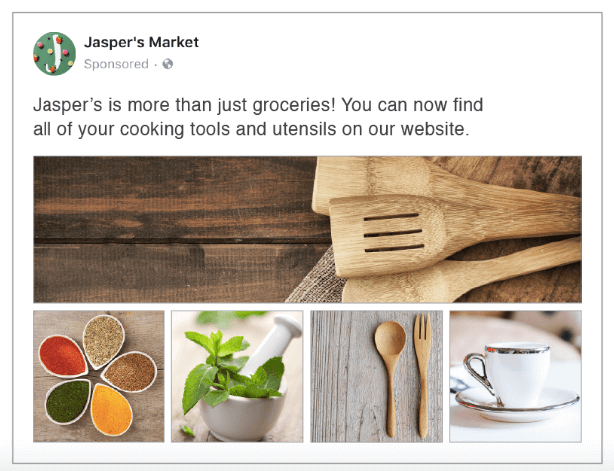 Facebook also assists in showing your ads to users who are similar to your current customers. It’s possible thanks to Facebook Lookalike Audiences feature. Furthermore, amazing targeting options turn Facebook Ads into your go-to traffic channel for mobile A/B testing of your app’s product pages. And finally, Facebook Ads enables amazing mobile customization, which is very important since you are targeting app users and gives you full control over the look of your ads, unlike Apple Search Ads. This mobile user acquisition channel requires a fair share of creativity from your side. Most users simply ignore sponsored content, so you must be able to design really powerful multimedia content or copies to grab the attention of your target group. At the same time, you also need to engage by following and answering user comment and inquiries. Even though Facebook Ads positions itself as a highly engaging ad channel, it’s not always true. Sure, Facebook users are very into their feed but they’re not necessarily in the mood for being interrupted with your ads and discovering new apps. So luring them into your app’s product page isn’t as easy as might seem. The numbers speak for themselves, the average conversion rate in Facebook Ads across all industries is 9,21%, the maximum conversion of 14.29% accrues to Fitness. And it’s only the conversion of the first step of mobile user acquisition. Now compare it with the 50% CR of Apple Search Ads within the App Store itself. So when it comes to mobile apps advertising, it’s way more sensible to consider ads within Google Play or Apple Search Ads. App store optimization (ASO): The first thing you have to take care of is ASO (check out our ASO Starter Pack). If you don’t create quality titles using strong keywords, good descriptions, and captivating visuals, users won’t be able to find your item in app stores. Social media marketing (SMM): With billions of daily active users, social media guarantee global exposure, so you have to utilize this channel to market your app. It’s a great way to engage with your audience and build long-term relationships with your followers. Search engine optimization (SEO): A vast majority of online experiences start with Google, so you have to improve organic presence as well. A website is there to provide users with top-notch content, which means you must regularly publish interesting content. If you don’t have the time or don’t want to do it alone, think about hiring professional services such as BestEssays.com to assist you with article writing. Mobile apps monetization is a challenging and time-consuming business. With so many mobile tools available online, it’s almost impossible to get your foot in the door without a fair share of paid advertising. We hope you found this overview of leading mobile app advertising channels helpful and it’ll help you to make smart decisions regarding your mobile app acquisition strategy. This post was created in cooperation with Alexandra Reay, an editor and professional writer at bestessaytips.com.